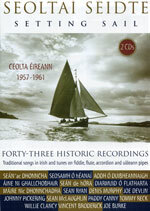 The Irish label Gael-Linn is celebrating its Golden Jubilee and has commemorated the event with the release of this magnificent collection, comprising all the recordings (43 in all) which the label released on twenty 78rpm discs between 1957 and 1961. Remastered to perfection by Harry Bradshaw, this collection is presented on two CDs, in a handsome DVD-style box, with a 96-page companion booklet authored by Irish Traditional Music Archives head Nicholas Carolan. The booklet, almost a book really, contains the detailed story of how the original records came to be made, comprehensive notes on all the performers and on each track, in particular with the full lyrics in Gaelic and English translation of the sean-nos songs which constitute about half the recordings. And what recordings! Since Gael-Linn's original goal was the promotion of the Irish language, it won't be a surprise that more than half of the tracks feature a real who's who of sean-nos singers, representing the major Gaelic-speaking areas, Donegal, Connemara, and Kerry/Cork. The list of instrumentalists is no less impressive, and the unaccompanied tracks by fiddle players Sean Ryan, Denis Murphy, and Paddy Canny have to be among the best recordings of traditional music of all times. Folks, this is how it should be done!